I love to eat. And every time I visit Tsukiji Fish Market, it annoys me that there are too many I want to have.What should I do? A la carte is a good choice. 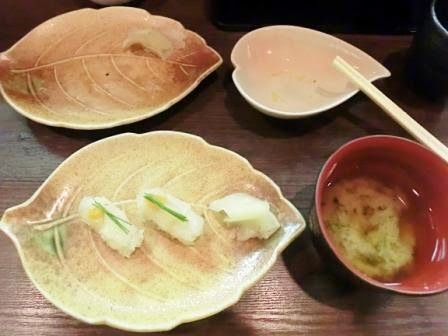 Beside a plate of sushi is fascinating and easy to order, there are some rare parts of tuna and rare kinds of fish in restaurants in Tsukiji, as I wrote in Tsukiji Market Sightseeing Guide. It is because Tsukiji is a wholesales market where every fish gathers to be delivered to the entire of Japan. I’ll show you some I had in my last visit! Have you heard of Fugu? It’s a high-grade fish in Japan. Tuna is major for sushi, (maybe salmon in some countries,) but there are many sushi of other kinds of fish. Beautiful! I was very lucky to meet them. I love it the best!! Red snappers are plain whitefishes, but just a bit oilier than other whitefishes, which makes them special. They are served as boiled fish in many cased. When it becomes sushis, so impressive! I was so happy to have it! I didn’t think they’d serve appetizer and miso soup. The cook said it’s lunch time sets. And don’t you think the dishes are beautiful? Cherry blossom (sakura) and leaves. And a mini dessert. 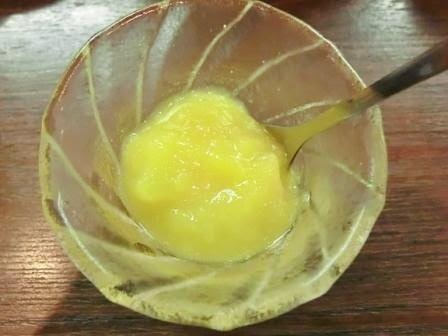 Orange paste. So it was a great experience there, after having some Japanese omelets. Everything was delicious. I’m so satisfied! Tip: Tsukiji is a town of early birds. It is not very common that a restaurant is open in the evening. Tip: Fish for sushi depends on the season and even the day of your trip. I wish your good luck! I have 2 more Dons that I want to eat. Hopefully I try and share them with you on this blog! Tokyo Travel Accommodation Advice Lists of good and convenient hotels. Access from Narita Airport. Learn tips from a local.